All day, every day, we make decisions which vary in intensity and importance. Some are really small and inconsequential involving routine matters like what to wear and what to eat, and these are really first world decisions. We seamlessly make these based on our past conditioning, guided very powerfully by the strength of our desires. So we do what gives us pleasure and stay away from that which causes pain. Which is why it becomes extremely difficult to decide on something which doesn’t give us any pleasure and may even cause us some pain. Those are the tough resolutions we loathe but have to take while mired in stress. Breaking a ten-year long relationship, giving up a job with no alternative source of income, eliminating sweets from your diet because you have diabetes and the list goes on. Decisions are nothing other than life choices. Taking tough decisions is character building. It’s easy to decide when the repercussions are less earth shattering but we certainly need to pause and deliberate while making the tough choices and that inevitably leads to stress, especially in those that have a difficult time making hard decisions. This type of person likes to be in charge and is the ‘decider’ in the group. We all have one of those in the family or in the office. They are the ones who have very good reasons for deciding everything from the next family vacation, to the airline they pick for business travel. They always take charge and know how to get things done. This person will never eat Chinese when the mood is for Indian cuisine especially if the suggestion comes from someone else. They need to have complete ownership of every decision. Highly strung and emotional, these individuals function at a very high level of anxiety and pass on their sense of urgency to others while continually reminding them who the decider was. This person loves someone else to take decisions and just follows suit without exerting any aspect of his personality. It doesn’t matter to him either way. He could eat Indian or Chinese or Azerbaijani food and it’s the same. It makes life easy when someone else is making the right decision leaving him with plenty of time to spare for other relaxing activities. Most often non-rufflers are easy going and relaxed, apparently unfazed by life situations. They live within their comfort zone and don’t take on any additional responsibility. People in this category really suffer because they cannot take any decision and stick to it. They are convinced that their first choice was good but at the first hint of opposition fall deeply into the canyon of self-doubt and immediate back out of the decision, taking an opposing view. But that doesn’t last long either. Yo-Yoing constantly between doubt, regret and the other choice, they drive themselves and others around them crazy. They live in their heads all the time doubting their circumstances, their situation, people and events, and for sure suffer from continual elevated stress and lack of self-esteem. Each one of us moves fluidly between these categories depending on where our priorities lie. A person might decide very easily about financial decisions in the office but make everyone crazy as he sluggishly picks from a menu. Similarly, one might flip flop between career choices but may make very good, unwavering, healthy, food choices. A decision is not this gigantic, phantasmal, nebulous shroud hanging heavily over you; it is nothing but a choice. 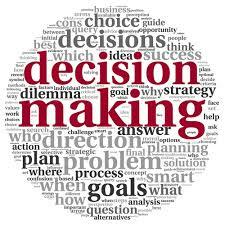 Decisions can be informed only when there is ample reaction time and one doesn’t have to act immediately. When you have to make important, life altering choices it is important to have some sort of mental map or plan. There is no substitute for due diligence which is the magic ingredient in creating the #marketingguru #greatdesicionmaker, great buzz words a.k.a. must-haves on one’s resume. Before making a choice gather as much information as possible. Begin by making a list of your requirements and priorities. This will help you organize your thoughts, your needs vs optional luxuries. Inform yourself about the other options as well. A good decision is weighed against other routes where based on your needs you pick the best alternative. Such decisions are most often not entirely cerebral and often enter into the realm of intuitive decisions. Always have something to fall back on in case your first choice doesn’t pan out. Take a decision as quickly as possible. There is a direct relationship between time and stress. Quite understandably. The longer you take, the more time you have to chew the cud and the longer you stay in your head, the greater the stress. Give yourself a cut-off date which might increase the pressure in the short run but will be a relief looking back, once the choice is made. Once you take the decision, commit to it. Take ownership of that decision. It was yours to make and was taken after measured thought and now you have to possess your situation completely. Second guessing your decision will lead to poor execution unhappiness and frustration. All life situations can never be purely clinical and intellectual. 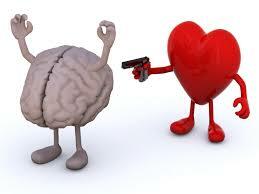 There are many circumstances where we have to sink into our source and function from the heart rather than the brain. Decisions that are tough and life-changing usually have the best results if they sprout from the source. Intuitive choices do not have logic and rationale backing yet tend to have the best results as they stem from your source which most often is your best resource. Intuitive choices feel natural and right and align with universal energies. It is that feeling when you step into a house and know it was built for you although it may not satisfy your specific criteria. However, no decision is stress free. 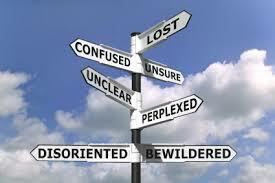 Stress arises while making decisions because we fear the unknown. What if it doesn’t go the way I want it to? What if I fail? What if this is the wrong thing to do? What if I lose all my money? And Family? What if they disapprove? Trying to please the whole world leaves you in state of utter confusion and shrouds you in stress, making you doubt every decision you make. Know that fear is nothing other than situations in your head about the future that may or may not happen. We don’t know the outcome for sure. Bring yourself back into the moment and do a fear check. Are they immediate or imagined? Awareness of fear reduces its intense hold over you and allows more balanced decision making. Commit 100% to the choice and go with the flow of life. Know that if this journey does not work for you there is always another choice. Life is filled with endless possibilities. And the Divine has filled you with deep reserves of abilities that only come up to the surface under pressure. At every turn there are hundreds of choices you could make. Pick one and go with it. Know that you are never in a situation you cannot deal with. There is never a problem without a solution. Sometimes the Universe decides which path you need to take and in the short run there is no alternative. In such situations acceptance is key.